Albertsons Stadium is an outdoor athletic stadium in the western United States, located on the campus of Boise State University in Boise, Idaho. It is the home field of the Boise State Broncos of the Mountain West Conference. Known as Bronco Stadium for its first 44 seasons, it was renamed in May 2014 when Albertsons, a chain of grocery stores founded by Boise area resident Joe Albertson, purchased the naming rights. Opened 49 years ago in 1970, it was also a track & field stadium and hosted the NCAA track & field championships twice, in 1994 and 1999. The stadium was used extensively for local high school football for decades until August 2012, when games were transferred a few blocks northeast to the new Dona Larsen Park, which is also the new home venue of Boise State's track & field team. Albertsons Stadium is widely known for its unusual blue playing surface, installed in 1986, while Boise State was in the Big Sky Conference. It was the first non-green playing surface (outside of painted end zones) in football history and remained the only one among NCAA Division I FBS schools for almost 20 years. Since 1997, it has hosted the Famous Idaho Potato Bowl (also called the Humanitarian Bowl from 1997 to January 2004 & 2007 to 2010; as well as the MPC Computers Bowl from 2004 to 2006), which is the longest-running outdoor bowl game in a cold-weather venue. Albertsons Stadium is located at the east end of the BSU campus, bordered by Broadway Avenue to the east, University Drive to the south, and the Boise River to the north. The elevation of its playing field is 2,695 feet (820 m) above sea level. Albertsons Stadium is the first venue to hold its name. 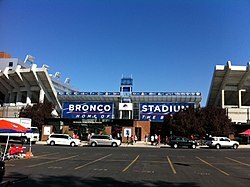 However, when it was Bronco Stadium, it was the fourth venue and second of the same name at Boise State; the three on-campus stadiums were built in 1940, 1950, and 1970, respectively. During its first years at its original campus, BJC football was played at "Public School Field", located three blocks north-northeast of today's Albertsons Stadium. The site was the home of East Junior High School from 1953 to 2009 until it was demolished and rebuilt further down Warm Springs Ave., and the previous area became Dona Larsen Park in 2012. The first "Bronco Stadium" was built in three months in 1950 at the east end of campus, with wooden grandstands, a natural grass playing field, lights, and a cinder running track; seating capacity was 10,000. It was in approximately the same location as the present stadium, but aligned northwest to southeast. (photo - 1964) The 45° offset was designed to keep the mid-afternoon sun of mid-October out of the players' eyes (but put it into the eyes of half of the spectators). The Boise College football program upgraded from junior college to four-year status in 1968 and competed as an NAIA independent for two seasons. The school became Boise State College in 1969 and the Broncos were accepted into the NCAA in October. A month later the school was voted into the Big Sky Conference, effective fall 1970. Following the 1969 football season, the first Bronco Stadium was razed in November and the new concrete stadium was ready for play in less than ten months. Boise State began NCAA competition in 1970 in the College Division (became Division II in 1973) in a brand new venue. The first game at the new Bronco Stadium was on September 11, a 49–14 victory over Chico State. The $2.2 million concrete stadium opened with a seating capacity of 14,500 and a green AstroTurf playing field, configured in the traditional north-south direction, and an all-weather running track. For its first five seasons, the stadium consisted of two sideline grandstands, the west side having an upper deck and the press box. (photo - 1971) Boise State became a charter member of Division II when the NCAA reorganized the former College Division in 1973. The Broncos moved to the Big West and Division I-A in 1996, which resulted in another stadium expansion. The two-tier grandstands were extended around the corners of the south end zone, raising the permanent seating capacity to 30,000 in 1997. The latest stadium expansion was completed in time for the 2008 season, with the addition of the Stueckle Sky Club press box, luxury suites, loge boxes, and club seating; raising the capacity to 32,000. In the summer of 2009, 1,500 additional bleacher seats were added to the south end zone to bring capacity up to 33,500. Prior to the 2012 season, expanded bleacher sections were added to the north and south end zones, expanding capacity to a total of 36,387. During its 11th season, the playing field at Bronco Stadium was named Lyle Smith Field during the I-AA national championship season of 1980. Ceremonies during halftime of the 14–3 victory over Nevada on November 8 marked the event. It honors Lyle H. Smith, the head coach from 1947 to 1967 and athletic director from 1968 to 1981, overseeing BSU's rise from the junior college ranks to Division I-AA champions in 1980. Smith led Boise, as BJC, to multiple post-season bowls, including the 1958 national junior college championship, and compiled an overall record of 156–26–8 (.842), which included five undefeated seasons and 16 conference titles. He was also the baseball coach for 17 seasons and served as basketball coach for a season at the school. Smith hired Tony Knap to replace himself as football coach in 1968, and Jim Criner to replace Knap in 1976.
for the soccer friendly in 2015. The current attendance record is 36,864, set on September 20, 2012 against BYU. In 2015, the stadium played host to a soccer friendly on July 18, named the Basque Soccer Friendly, between Athletic Bilbao of La Liga vs Club Tijuana of Liga MX. To accommodate the game, a natural grass surface was laid on top of the famous blue turf to conform to La Liga rules. It was the first time since 1985 that the stadium featured a green surface for any sporting event. Before a crowd of 21,948, Athletic Bilbao won 2–0. The fifth overall and second blue FieldTurf in August 2010; installed a month earlier. Albertsons Stadium is best known for its distinctive blue playing surface, which was the only non-green football playing surface among Division I FBS programs from Boise State's entry into what is now FBS in 1996 until Eastern Michigan installed a gray surface at Rynearson Stadium in 2014. Chris Berman of ESPN has also called Boise's turf "The Blue Plastic Tundra", a joking reference to "the frozen tundra" of Lambeau Field in Green Bay, Wisconsin. Another nickname for the surface is "Smurf Turf." Players refer to it simply as "The Blue." BSU replaced the first blue AstroTurf with the same in 1995, then with blue Astroplay (a grass-like synthetic surface that is more forgiving than traditional AstroTurf) in 2002. The AstroPlay field lasted just six seasons and was replaced in the summer of 2008 with blue FieldTurf surface. Due to complaints by fans that the reflection and glare off the field gave the new field a dull and uneven shade of blue, FieldTurf agreed to replace the field free of charge. The fifth blue turf was installed in the summer of 2010. The unique blue turf has spawned several myths. The most prevalent is that the NCAA subsequently banned playing surface colors other than green, but allowed Albertsons Stadium's field to remain blue under a grandfather clause. In reality, the NCAA has never adopted such a rule. Any school may color its playing surface (or any part of the surface, such as the end zones) any color it wishes. Indeed, since 1986 other schools have non-green football fields including the University of New Haven (blue) and Eastern Washington University (red). On April 1, 2011, the University of Central Arkansas announced it would install a purple and grey striped field to Estes Stadium. In 2012, Lindenwood University in Belleville, Illinois, played their first football season, on a home field with alternating maroon and gray stripes. The blue turf at Boise State remained the only non-traditionally colored field used by a Division I FBS program until June 2014, when Eastern Michigan announced it would install a gray FieldTurf surface at Rynearson Stadium in time for the 2014 season. Another myth is that, mistaking the blue field for a large body of water, birds have flown into the blue turf and to their deaths. Although Bronco head coach Chris Petersen claimed to have found a dead duck on the field in 2007, the origin of the duck on the field has never been confirmed. BSU's blue turf has become such a highly visible icon for the Broncos that BSU obtained a U.S. trademark registration for a blue athletics field in November 2009. In 2010, this trademark was extended to any non-green field. In 2011, the NFL banned any playing surface color other than green, naming the rule the "Boise Rule" in reference to the university, though this was more a reaction to sponsor influence as no team had ever proposed a different turf color for its field. Also in 2011, the Mountain West Conference banned Boise from wearing its all-blue uniforms during home conference games, after complaints from other Mountain West coaches that it was an unfair advantage. However, the uniform restriction was removed from the 2013 season forward, as part of the deal that kept Boise State in the MW after it had originally planned to leave the conference. In October 2014, Boise State's blue field topped USA Today's Fan Index list of top 10 best fields in college football. As the Boise State football program rose to national prominence in the early 2000s, Albertsons Stadium became increasingly insufficient. The school completed a three-story complex on the stadium's west side called the Stueckle Sky Club (pronounced Stickle). Construction began on February 11, 2007, and the facility officially opened on August 27, 2008 with a gala for ticket holders prior to the first game on August 30. It features levels for a new press box, luxury suites, loge boxes, and club seating and increased seating capacity to 32,000. The practice facility, named the Caven-Williams Sports Complex, officially opened in February 2006, and is located immediately northwest of Albertsons Stadium. The university added additional temporary seating for 1,500 prior to the 2009 season. The removable bleachers increased capacity to 33,500. It also added permanent bleachers to the north and south end zones prior to the 2012 season, raising Albertsons Stadium's capacity to a total of 37,000. In late August 2010, the athletic department revealed expansion plans for Albertsons Stadium. The first stages were to include adding a new facility to the north end zone to house the football offices, weight room, training room, equipment room and locker room. Plans also included a 13,200 seat grandstand. The later stages of the expansion plan included removal of the track, lowering of the field, and adding 3,300 seats in front of the first deck of the stadium, completion of the south end zone horseshoe, building of an east side skybox, and renovation of the east side concourse. The total cost for all planned expansions was around $100 million. The total seating capacity for a fully expanded Albertsons Stadium was estimated to be around 53,000. In April 2012, the university broke ground on a revised expansion which it hoped to complete by June 2013. During Boise State's recent streak of conference championships, Albertsons Stadium has proven to be a tough place for opponents. As of December 1, 2018, the Broncos are 121–9 (.931) at home since the 1999 season. The Broncos won 47 straight home conference games from 1999 to 2011 and were undefeated in conference during their 10 years in the WAC (40–0). The Broncos are 116–7 (.943) in regular season home games since 1999, and had a winning streak of 65 regular season games from 2001 to 2011. The stadium expanded to 36,387 in 2012 and the highest attendances have all come since. ^ Cripe, Chadd (May 21, 2014). "Boise State's Bronco Stadium is now Albertsons Stadium". Idaho Statesman. Boise. Retrieved May 21, 2014. ^ a b "Bronco Stadium "The Blue"". Boise State University Athletics. Archived from the original on December 4, 2008. Retrieved December 28, 2007. ^ "Earth Explorer: 43 36 21 N 116 11 50 W". United States Geological Survey. Archived from the original on December 28, 2007. Retrieved December 28, 2007. ^ "Boise State drops baseball program". Lewiston Morning Tribune. Idaho. Associated Press. May 6, 1980. p. C1. ^ Goodwin, Dale (May 13, 1980). "Baseball's 'out' at Idaho". Spokesman-Review. Spokane, Washington. p. 19. ^ "Lyle's House: 1950-1969". Bronco Country.com. August 12, 2010. Retrieved March 2, 2017. ^ "Boise eyes 1970 berth in Big Sky". Spokesman-Review. Washington. Associated Press. August 24, 1967. p. 16. ^ "Boise State joins NCAA". Spokane Daily Chronicle. Associated Press. October 15, 1969. p. 44. ^ "Boise State, Northern Arizona admitted to the Big Sky". Lewiston Morning Tribune. Idaho. Associated Press. November 26, 1969. p. 13. ^ a b Ourada, Patricia K. (1994). "The Broncos: A History of Boise State University, 1932-1994". p. 131. Retrieved August 27, 2012. ^ "BSC wants $1.4 million for stadium addition". Lewiston Morning Tribune. Idaho. Associated Press. December 1, 1973. p. 15. ^ "Bronco Stadium Information". Archived from the original on January 25, 2013. ^ "2013 Weekly Release" (PDF). Boise State Athletics. August 26, 2013. Archived (PDF) from the original on August 26, 2013. Retrieved August 26, 2013. ^ "Lyle H. Smith collection". Boise State University Albertsons Library. Archived from the original on December 9, 2007. Retrieved December 28, 2007. ^ "Bronco Football: A Winning Tradition". Boise State University Athletics. Archived from the original on June 29, 2009. Retrieved December 28, 2007. ^ Levin, Bryan (July 19, 2015). "Athletic Bilbao wins Basque Soccer Friendly". KBOI-TV News. Retrieved March 2, 2017. ^ "Boise's Blue Field Turns 20". CBS Sports Network. Associated Press. September 14, 2006. Retrieved September 25, 2009. ^ "Boise State Broncos Choose FieldTurf to Replace Current Blue Turf At Bronco Stadium". GlobeNewswire. May 23, 2008. ^ "New Boise State turf to reduce glare". ESPN. Associated Press. April 20, 2010. ^ "Fast Facts". University of New Haven. Archived from the original on September 6, 2010. Retrieved September 25, 2010. ^ Hinton, Matt (January 28, 2010). "Eastern Washington literally seeing red over new turf". Yahoo! Sports. Retrieved September 25, 2010. ^ "Purple & Gray Turf Coming to Estes Stadium" (Press release). University of Central Arkansas. April 1, 2011. ^ "EMU Installing Gray FieldTurf Surface at Rynearson Stadium" (Press release). Eastern Michigan University Athletics. June 17, 2014. Retrieved June 23, 2014. ^ "Bronco Stadium BSU". Archived from the original on December 18, 2007. Retrieved December 28, 2007. ^ "Boise State Somehow Got A Trademark On Non-Green Athletic Fields". Techdirt. Retrieved September 15, 2016. ^ Rosenthal, Gregg (March 22, 2011). "There will be no blue NFL fields". NBC Sports. ^ Treadway, Daniel (July 27, 2011). "Boise State Banned From Wearing Blue Uniforms On Smurf Turf". The Huffington Post. ^ "Boise State to stay in Mountain West". Sports Illustrated. December 31, 2012. Retrieved January 1, 2013. ^ Siegel, Alan (October 13, 2014). "The 10 best fields in college football of 2014". USA Today. Retrieved October 24, 2014. ^ Sondermann, Martin (May 16, 2013). "Boise State Football: Bronco Stadium Upgrades Benefit the Program and the Fans". Bleacher Report. ^ "Caven-Williams Sports Complex". Boise State University. Retrieved March 2, 2017. ^ "Longtime Boise State Donors Williams, Caven Pledge $5 Million to Bronco Stadium Expansion" (Press release). Boise State University. November 20, 2010. ^ "Boise State Breaks Ground on New Football Complex" (Press release). Boise State University. April 12, 2012. Wikimedia Commons has media related to Albertsons Stadium. This page was last edited on 16 April 2019, at 05:40 (UTC).